Podcast-specific hosting companies significantly simplify the uploading process; many include web-based forms that take the place of additional computer programs to handle the uploading process. They also take care of archiving, RSS 2.0 creation, and even ID3 tagging. Begin at LibSyn’s home page. Enter your username and password and press the Login button. Click the Content menu option and select Add New Episode. You are taken to the New Content page. Adding media files to a LibSyn account doesn’t require an FTP client. Click the Add Media File button. Click Upload File From Hard Drive if your files are on your local hard drive. There are other options available if your file is on another server accessible via FTP or Dropbox. The File Upload dialog box opens. Find the podcast media file you want to upload and either double-click the file or select it and click Open. If you’ve used proper ID3 tags on your podcast — and you have by this point, right? — you can check the Populate Form with ID3 Data checkbox to save some time. Just be aware that the description may need some additional formatting as the importer doesn’t recognize paragraph breaks. Also check your title and description for encoded characters. You may need to do touch-ups like replace & with the & character. If you did not choose to import the content of the ID3 tags, enter the information for your blog and/or podcast in the form. The blog settings are very simple: things like the name of your blog, your email address, and what category you want it placed in. Nothing here is mission critical, so fill it out however you want to see it listed. You can always come back and change it later. When you finish, click the Publish button. While LibSyn has full hosting capabilities, some may find the blogging feature a bit limited and use LibSyn as a file repository while hosting their blog on their own site, then referencing the files on LibSyn from their blog. 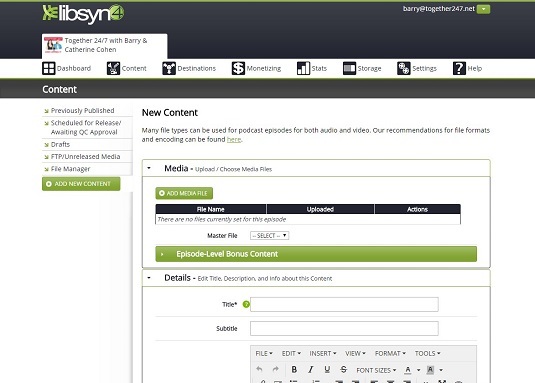 To access files stored on LibSyn in your blog (and resulting RSS feed) follow the preceding steps to upload and publish the content. Then follow these steps after your file is published. Go to the Content menu and select Previously Published. Locate the file in the list and click the Link/Embed icon for that episode. Copy the URL from the Direct Download URL field and use that as the location of your file in your blog software as needed. LibSyn offers an FTP interface if you prefer to use an FTP client or command line interface. Your login and password are the same as through the web interface. If you prefer to try it before you buy it, LibSyn offers up to a free month with the promo code podcast411 allowing you to get a feel for how it works before you fork over your hard-earned cash. Not that the very inexpensive monthly fees will break you or anything, but it’s nice to know how your future home might work.